With stretches of forest areas and greenery spreading throughout the state, Odisha is relatively a lesser explored tourist destination that has so much to offer. Mostly known for the Sun Temple of Konark or Jagannath Temple of Puri, Odisha is a state that gleams with intriguing tribal culture and heritage. Lip-smacking dishes of Odisha cuisine are bound to make you fall in love with the state! Revel in the rock carvings, temples, lakes and unexplored Buddhist universities. However, there's more to Odisha than food and places of interest. Read about these festivals that are celebrated every year with utmost splendour. Jagannath Rath Yatra is one of the most anticipated annual festivals, that happens during the months of June or July in Puri. Like the name suggests, it is dedicated to Lord Jagannath, that is Lord Krishna, along with his siblings Lord Balaram and Goddess Subhadra. Idols of the three gods are taken on wooden chariots right from Jagannath Temple to Gundicha Temple in Puri. These chariots are the main attraction of the festival since they are elaborately decorated 26-ft-tall chariots running on 14-18 wheels each! Chaitra Parva Chhau Festival is celebrated every year during the month of April. This 3-day-long festival is mostly celebrated by the Bhuiyan tribes in Odisha. 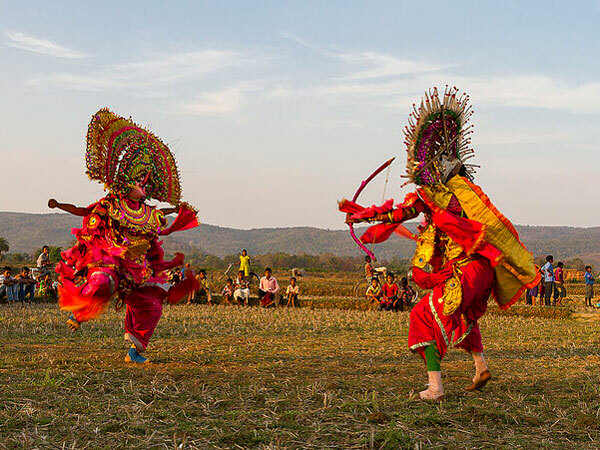 The main attraction of the festival is the performance of Chhau dance by the people of Odisha. Chhau dance is a semi-classical form of dancing that includes a little bit of martial arts and folk elements. The dance is performed while wearing a mask or chhau that comes from the word "chaya" which means shadow. Apart from dancing, the festival is a fun-filled celebration that includes singing, dancing, performing dramas and indulging in grand feasts. Started in the year 1986, the Konark Dance Festival is celebrated to bring together artists of all forms of classical dance forms and perform at a single stage. Thereby, getting international recognition to these classical dance forms. The festival is celebrated between 19th to 23rd of February every year. Some of the dance forms performed by the national as well as international artists include Manipuri, Bharatnatyam, Kuchipudi, Odissi, etc. It is also accompanied by musical performances by acclaimed artists. Celebrated during the months of September or October, Durga Puja is a grand festival that is celebrated all across India. Odisha also sees a boisterous celebration with pandals put up in all of the state during this season, where idols of Goddess Durga are displayed, sometimes along with her two avatars of Maa Saraswati and Maa Lakshmi. This festival lasts for 3-4 days and is one of the most important events of the year for Hindu devotees. Pandal decorations are the main attraction of this festival. The festival is celebrated with utmost grandeur in Bhubaneswar and Cuttack. Kalinga Mahotsav is a festival that celebrates the win of peace over war. This is done by performing beautiful martial arts of India, as a tribute to Kalinga, the region that saw the bloodiest war during the reign of King Asoka. It is celebrated in February every year. The festival promotes the traditions of India by giving way to martial art performers, from all over the country, to participate in the festival. Some of the martial arts that you will witness here include Chhow and Paika from Odisha, Thang Ta from Manipur, Kalaripayattu from Kerala, to name a few. Makar Mela, which is popularly known as Makar Sankranti, is a festival that is celebrated throughout the country. However, each region has its own unique way of celebrating the festival; Odisha also has a specific way. Makara chaula is a major part of their festival, which is a dish made of uncooked, newly harvested rice along with condiments like jaggery, coconut, etc. It is celebrated in January every year throughout the country. Thousands of people gather from all over the country to witness and take part in the International Sand Art Festival that takes place in Chandrabhaga Beach which is located 3 km from Konark. National and international sand artists participate in this festival and compete for a certain cash prize. The festival is a relatively new introduction that began in 2015 and still needs to gain more attention. The festival happens between 1st to 5th December every year.